James D. Julia's February Fine Art, Asian & Antiques Auction Produces Over $3.3 Million! This annual sale, held on February 8th and 9th, caught the world's attention with its museum quality fine and decorative art, breathtaking historical artifacts, and top tier antique offerings. Fernando Botero, "A Lawyer" realized $150,750. James D. Julia’s mid-winter auction launched the 2018 auction season in the most auspicious way possible, with bidders competing for the spectacular lots on offer. After the hammer finally fell silent, 48 lots made $10K or above. In addition, 9 lots realized $25K or more, and 10 lots broke the $50K mark! James D. Julia's Fine Art, Asian & Antiques auctions enjoy a well-deserved reputation of offering only the finest selections of carefully curated paintings, and this auction did not disappoint on any level. 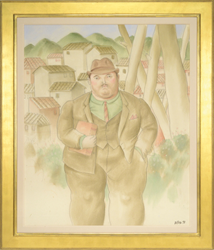 The top lot in this event, Fernando Botero’s “A Lawyer,” made it legal at $150,750 on a $125,000-175,000 estimate. This masterpiece features a portly, pensive looking man carrying a book and is signed “Botero 98.” It appears in Marc Fumaroli’s Botero Drawings, 1999. “Happy New Year,” a painting attributed to Frenchman Paul Emile Chabas, realized $24,200 - over six times its low estimate. 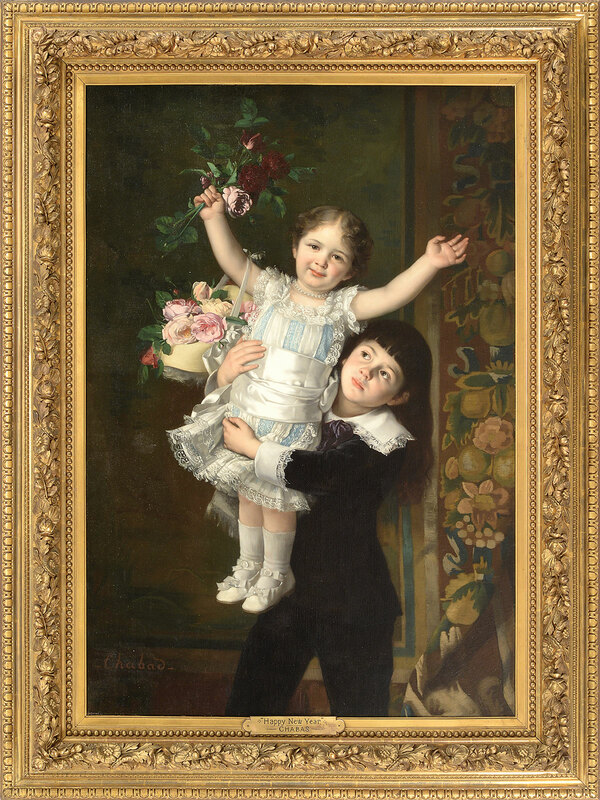 This joyful work comes alive with two finely dressed, cherubic children and bouquets of peony flowers. 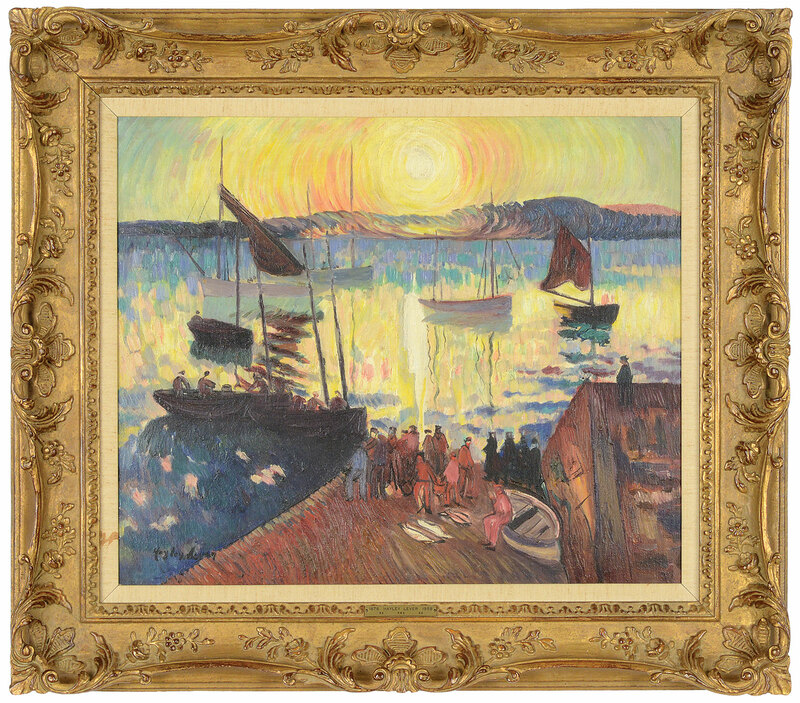 Works by Haley Lever were well represented in this sale, with his “Fishing Boats – Sunrise” from 1904 reeling in $60,500. This handsome, signed painting is titled on a Clayton-Liberatore Art Gallery label. And Morris Graves’ “War Maddened Bird Following St. Elmo’s Fire” tempera on paper soared to $81,675, more than four times its low estimate. 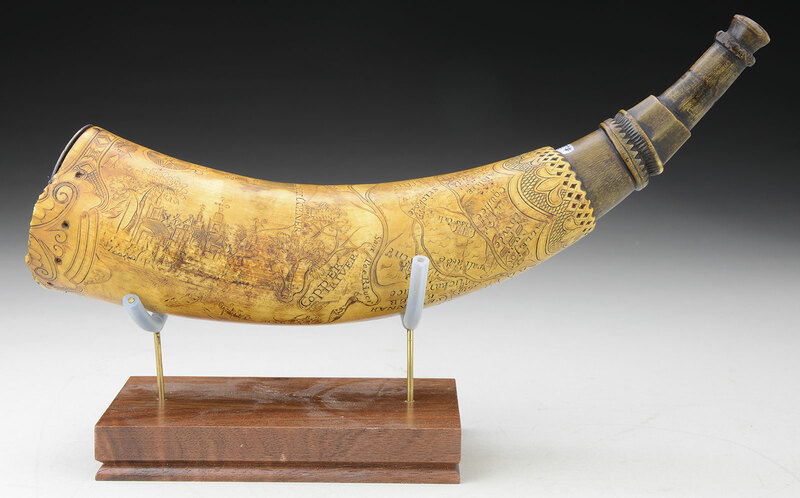 Enthusiasts battled over this sale’s fine selections of exceptional powder horns from important collections. A group of 13 Revolutionary War-era powder horns, carved by the “Folky Artist,” sold for $27,225. This group represents 13 of about 30 known horns carved by this artist whose name has been lost to history. He is thought to be from the south, as southern icons, such as palmetto trees, long leaf pine sprouts, and a Spanish mission, are among the subjects engraved on his horns. A French and Indian War Pennsylvania map horn changed hands at $58,080 - almost four times its low estimate. This detailed example is illustrated starting in Philadelphia and moves north along the Allegheny and its forks depicted as “Monagahny” and Ohio to Lancaster, Carlisle, Shippensburgh, Fort Louden, Fort Lettelton, Fort Stony Creek, Fort Bedford, and Fort Ledgner, and features a great drawing of Fort Pitt flying a British flag on a pole. 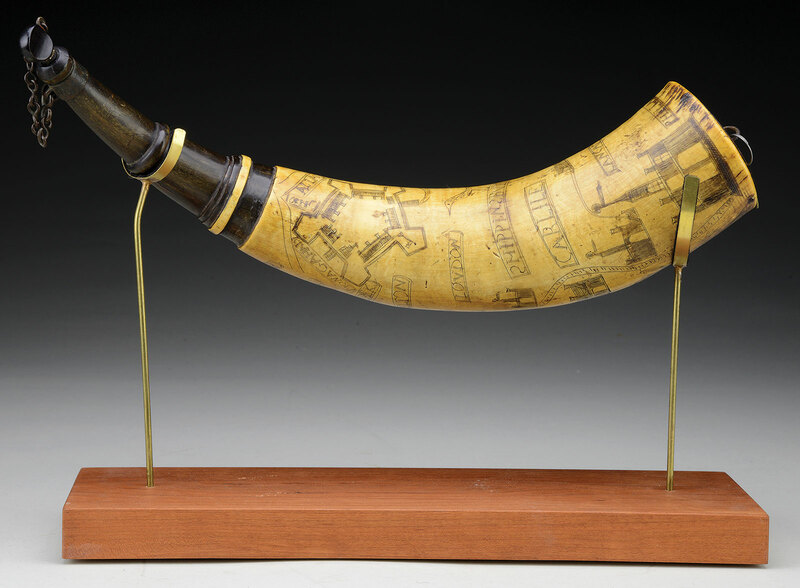 And a Charleston, SC map horn realized a whopping $78,650 on its $8,000-12,000 estimate. This museum quality artifact is carved with exquisite attention and shows a view of Charleston and its rivers branching into the “Congarees,” “Saux Tee,” “Keeowee,” and others. This remarkable sale also made history with its once-in-a-lifetime offerings of antique archival materials, ephemera, and items associated with important people, places, and things. 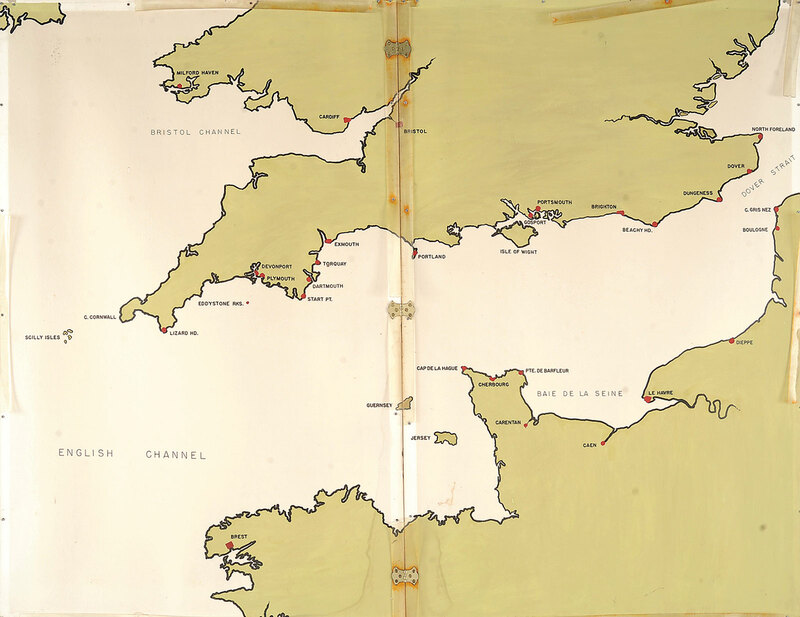 Four massive hand drawn and painted planning maps used by Morton L. Deyo, a World War II hero who commanded naval gunfire support at Utah Beach in the Normandy invasion - amongst other notable accomplishments - sold for $7,620. A “Barbary Pirate” flintlock pistol from the Stephen Decatur estate shot to $18,150 on its $1,000-2,000 estimate. Decatur led successful naval battles in both Barbary Wars, North Africa, the French Quasi War, and the War of 1812; family legend holds this pistol was a souvenir from the Barbary Coast wars. A solid gold Tiffany presentation snuff box presented by the citizens of Buffalo to Lt. John Worden made $48,400. Worden was the hero of the Victory of the Monitor Over the Merrimac. 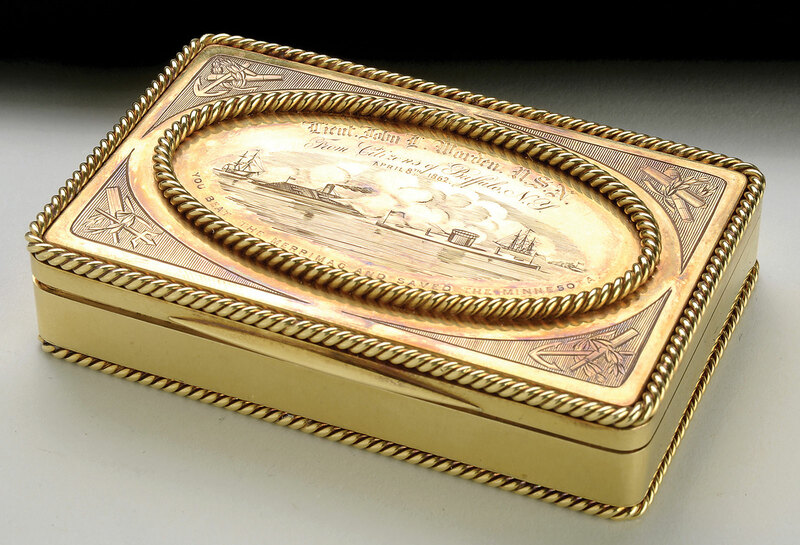 This handsomely decorated box is engraved with the battle scene between the U.S. Navy Ironclad “Monitor” and the Confederate Navy Ironclad “C.S.S. Virginia” (Merrimac), as well as other naval themes. Our catalogers noted that this is one of the most important American Civil War U.S. Navy artifacts to be presented for public auction. And a wonderful time capsule text, “Manuscript Rules And Regulations of USS Congress And USS Constitution, 1817-1821” cruised to $62,920 on its $15,000-25,000 estimate. Enthusiasts also saluted the fine offerings of flags on offer through this sale. 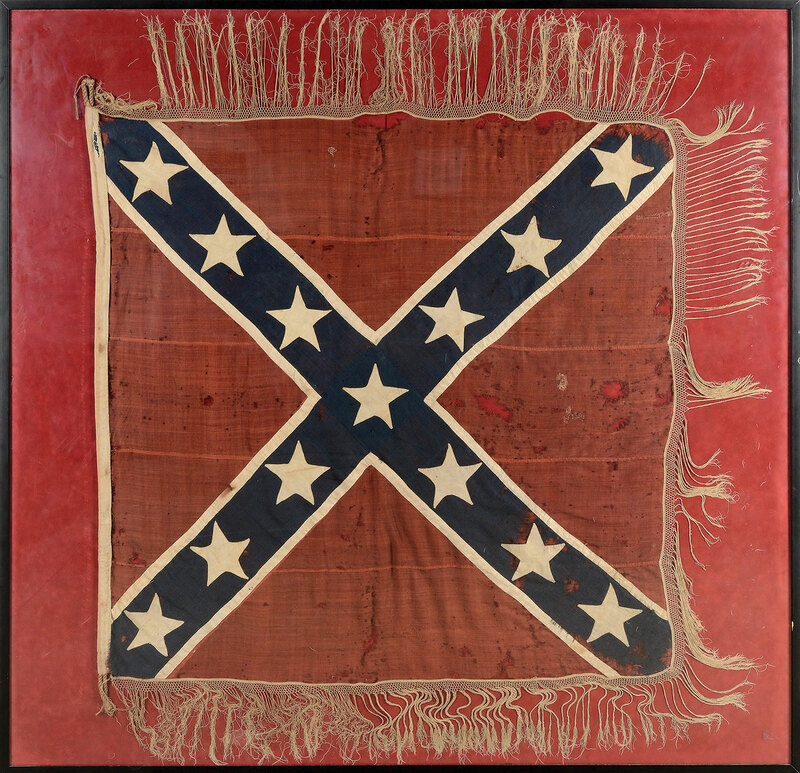 An iconic 12-star Confederate 1st National Flag from the renowned Boleslaw And Marie-Louise Mastai collection made $76,230. This remarkable rarity was pictured on cover of the 1973 text “The Stars and the Stripes: The American Flag as Art and as History From the Birth of the Republic to the Present” by Mastai. And a Confederate Battle flag made $70,180. This incredibly rare example closely follows the pattern of ANV (Army of Northern Virginia) battle flags and is totally hand sewn. Eye-catching Asian treasures gave this sale a touch of international intrigue. 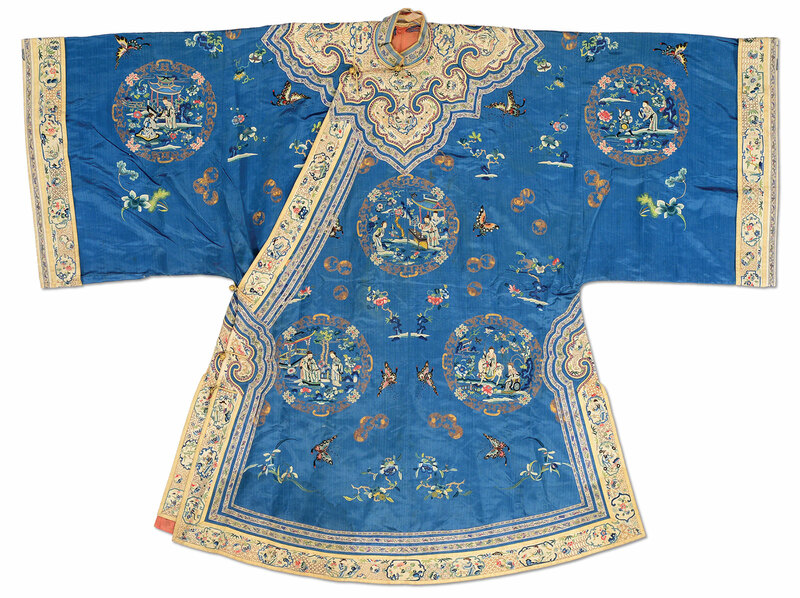 A Chinese silk embroidered robe sold for $7,260 on an $800-1,200 estimate. This early 20th century blue silk example is decorated with roundels of various figures within a landscape; its collar and seams are accented with ruyi and fastened with gilded buttons. And a Satsuma pottery vase by Yabu Meizan almost doubled its high estimate, realizing $11,495. 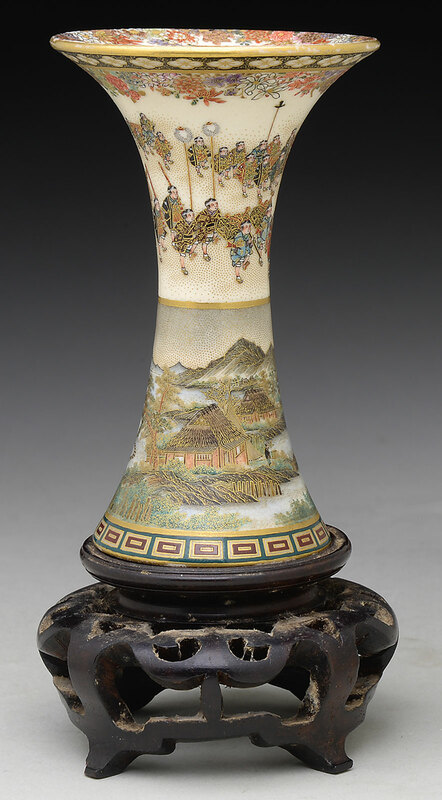 This fine Meiji period beaker shaped vessel is exquisitely painted with a continuous waterfront landscape around the lower half and a procession of figures around the top. Fine antiques from a wide array of specialty categories tempted collectors throughout this two day event. A cast iron “The Yankee Schoolmaster” (also known as “The Alphabet Man”) made $25,410. This toy was designed as an early educational vehicle to teach children the alphabet or various words; only a handful of these elaborately constructed rarities survived over the past 100+ years. A pair of massive, engraved walrus tusks signed by artist Nathaniel Finney blew away their $6,000-8,000 estimate to sell for $91,960. These c.1870 tusks are illustrated with vignettes of popular actors who worked in San Francisco during the 1860s-1870s, and include the founding members of the California Troup of Actors associated with the California Theatre. An outstanding solid gold Russian hinged box decorated with a micro mosaic top closed the deal at $50,820 on its $4,000-6,000 estimate. Its 2" x 3" scene shows a man on a horse crossing a river with others following, while women are seen on foreground with soldiers. And an important carved and polychrome painted tobacconist figure of Native American man, attributed to Thomas Brooks, was on fire... eventually realizing $26,015. This truly outstanding example has provenance to Danbury, Connecticut by descent to its current owner and was featured on a 1/2 page in color in National Geographic Magazine, September 1931, vol. LX, number three, illustration VII. James D. Julia, Inc., a division of Morphy Auctions, is one of the top ten antique auction antique houses in North America as measured by annual sales. The company has routinely established new world records through three key divisions, including Rare Firearms; Fine Art, Asian & Antiques; and Rare Lamps, Glass & Fine Jewelry. Each division is regarded for its excellence and is staffed with world-class specialists to guarantee fair and professional authentication, identification, and valuation services. In December of 2017, James D. Julia, Inc. merged with Morphy Auctions of Denver, PA. Morphy Auctions and James D. Julia, Inc. share a common purpose of delighting collectors worldwide with aligned missions and unparalleled customer service standards. Joining forces creates a synergistic team of passionate staff members to better serve our customers and strengthen the antiques and collectibles industry. All future auctions after March 2018 will be held at Morphy Auctions in Denver, PA and Las Vegas. For more information, please click here. James D. Julia, a division of Morphy Auctions, located in Fairfield, ME and Woburn, MA. Hayley Lever, "Fishing Boats - Sunrise" realized $60,500. Morris Graves, "War Maddened Bird Following St Elmo's Fire" realized $81,675. Attributed To Paul Emile Chabas, "Happy New Year" realized $24,200. Silk Embroidered Robe realized $7,260. Satsuma Pottery Vase By Yabu Meizan realized $11,495. 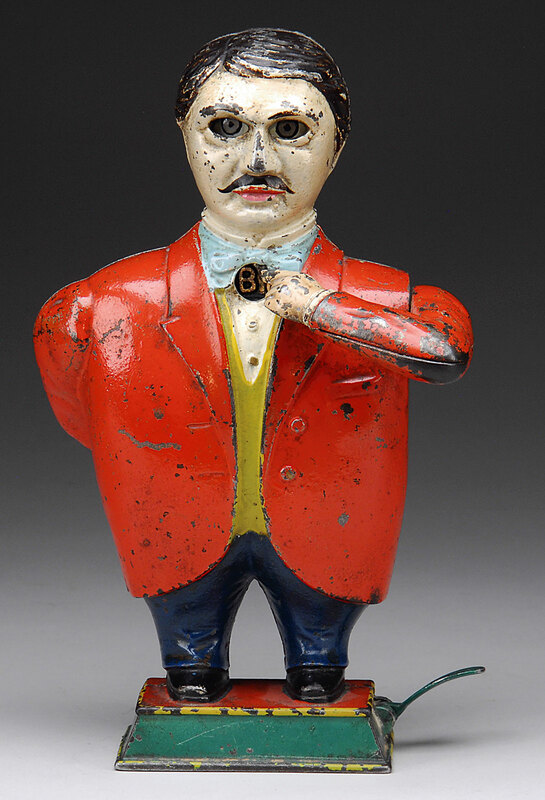 Cast Iron Toy "The Yankee Schoolmaster" Or "Educational Toy" realized $25,410. French & Indian War Pennsylvania Map Horn realized $58,080. Thirteen Revolutionary War Era Powder Horns realized $27,225. Charleston, South Carolina Map Horn realized $78,650. 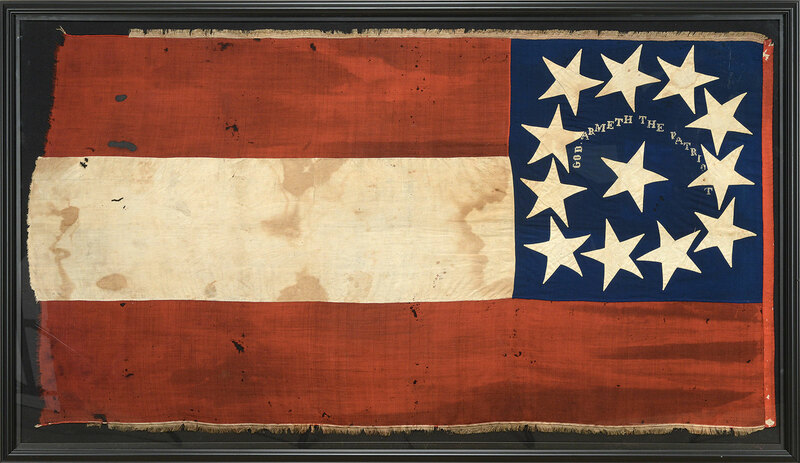 12-Star Confederate 1st National Flag realized $76,230. Confederate Battle Flag realized $70,180. Tiffany Presentation Snuff Box realized $48,400. 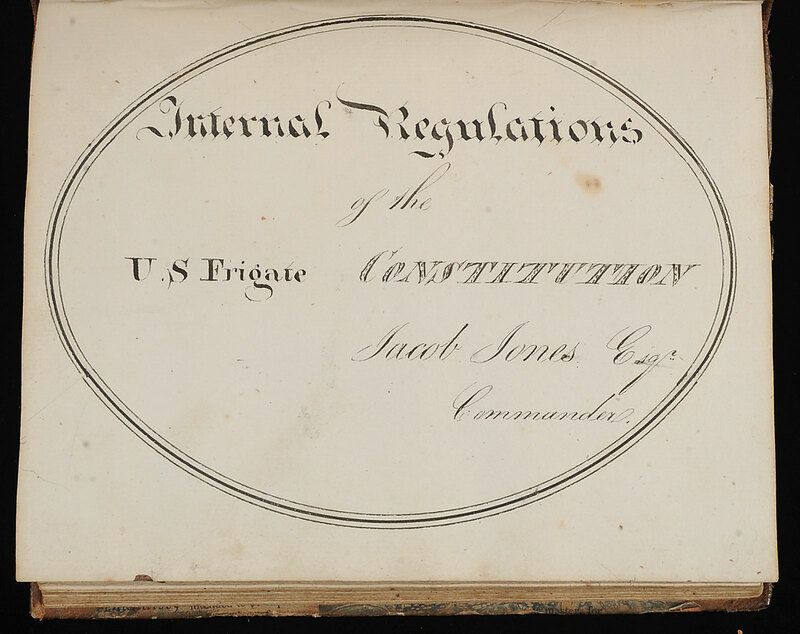 Manuscript Rules and Regulations Of USS Congress And USS Constitution, 1817-21 realized $62,920. "Barbary Pirate" Flintlock Pistol From Stephen Decatur Estate realized $18,150. Massive Engraved Walrus Tusks realized $91,960. Historic Lot Of Four Planning Maps Used By Admiral Morton L. Deyo Abo realized $7,260.